The poll also found them willing to crack down on immigration in a number of other ways — punishing employers who knowingly hire illegal immigrants, taking in-state tuition away from immigrants' children, opposing a path to citizenship for immigrants who are currently in the country illegally and cracking down on so-called sanctuary cities. The poll revealed splits by political party but also a wide divide on some issues between voters of different races, illustrating the political perils of taking strong positions on some immigration questions. "It continues to be a dangerous area … where we see the greatest difference between Hispanic and other voters," says pollster Jim Henson, who teaches government and runs the Texas Politics Project at UT. Texans say they would change the 14th Amendment, which grants citizenship to those born on U.S. soil whether their parents are here legally or not. It was a narrow majority — only 53 percent — but only 37 percent would oppose that change. Republicans strongly favor that change; Democrats oppose it. And the racial divide is large, with 63 percent of whites in favor, while only 32 percent of blacks and 34 percent of Hispanics favor a change. Sanctuary cities, where local police don't actively enforce federal immigration laws, are unacceptable to 69 percent of voters. Just 17 percent approve of city governments that choose not to enforce all of those federal laws. That was an issue in the gubernatorial campaign, and Gov. Rick Perry included it among the "emergency" issues lawmakers can address during the first two months of the current legislative session. Democrats are more likely than Republicans to approve of sanctuary cities, but that's not a majority view: Only 31 percent of Democrats feel that way. 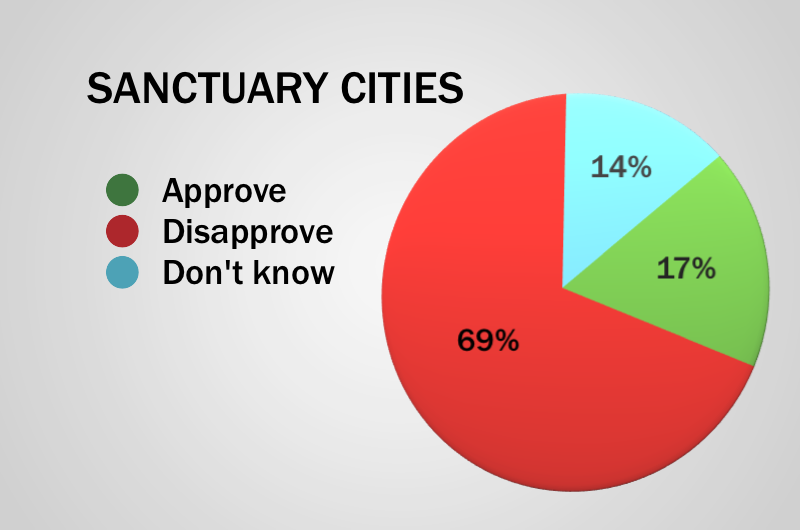 That's a significant difference from Republicans: Only 4.5 percent approve of sanctuary cities. Majorities of white and black voters oppose sanctuary cities, too; Hispanics were opposed, but not as strongly, with 42 disapproving and 36 percent approving. A nearly unanimous majority would put some of the burden for immigration enforcement on business; 87 percent support requiring employers to verify the immigration status of every worker and fining businesses caught intentionally employing illegal immigrants. That includes 70 percent who strongly favor the idea. Only 11 percent oppose that policy, and the support cuts across demographic lines. However you slice it — gender, race, age, party, race, geography — Texans put the onus on business. 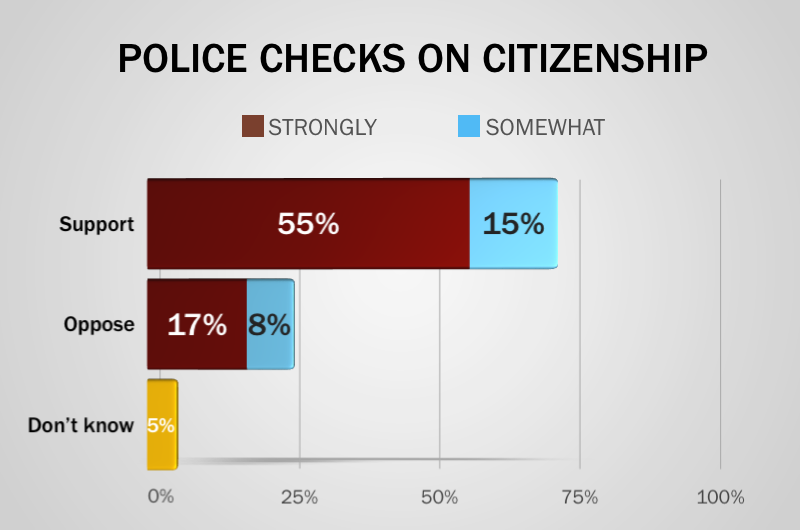 Police should carry some of the burden, too, according to 70 percent of those polled. Only 25 percent would oppose requiring law enforcement officers to check the immigration status of people they suspect of being in the country illegally. Unlike the business question, there are some differences here: Republicans are more supportive than Democrats, and whites are more supportive than blacks and much more supportive than Hispanics. Conversely, only 52 percent — a majority, but a slimmer one — would prohibit businesses from soliciting workers at day labor sites. About a third would oppose that prohibition. 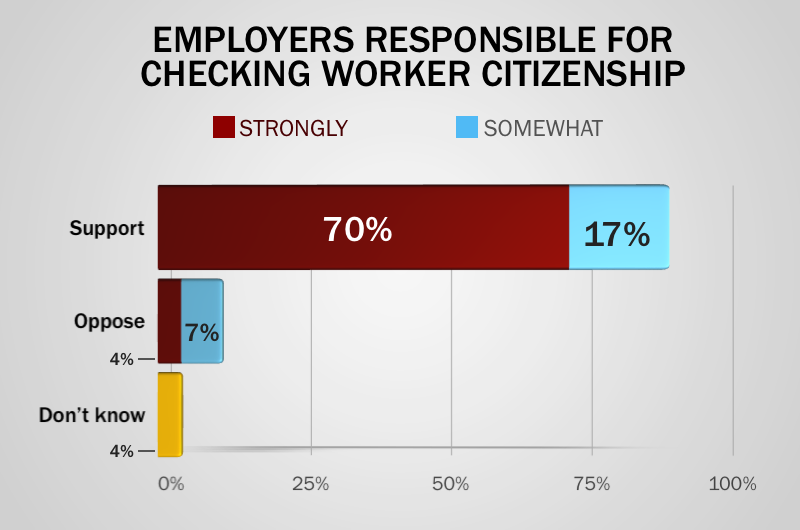 The pollsters say voters are making a distinction in the types of work people are doing, and how enforcement should work. "Employer says 'business.' Job site says 'working in my yard,'" says Henson, who conducted the poll with Daron Shaw, a professor of government at UT. Texas law gives in-state tuition rates at state colleges and universities to resident children of illegal immigrants, and 59 percent of voters say they would revoke that law and charge those students at the higher out-of-state rates. Only 27 percent would keep them at the in-state tuition level, the poll found. Most Texas voters — 54 percent — oppose creating a path to citizenship for most illegal immigrants already living in the U.S. A large number — 41 percent — strongly oppose such a path. 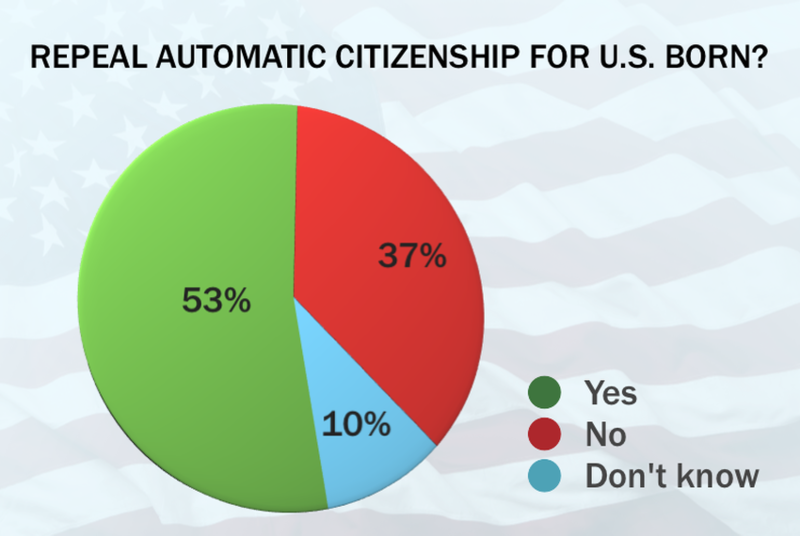 Two in five support a path to citizenship, 17 percent of them strongly so. This issue splits along partisan lines: A majority of Democrats are for it, a majority of Republicans are against it, and independents are split right down the middle. There is also a racial divide: 31.4 percent of whites support a path to citizenship, compared with 48.5 percent of blacks and 61.3 percent of Hispanics. This University of Texas/Texas Tribune poll is an internet survey of 800 registered voters conducted Feb. 11-17 and has a margin of error of +/- 3.46 percent. The poll methodology, full crosstabs and a summary of all the questions and answers are attached.